Way back in February we bought a Groupon to Kyu Sushi. We spent $25 for $50 worth of sushi. However, as I was 7.5 months pregnant at the time, we really did not feel like driving downtown. Today we finally redeemed the Groupon, and we thoroughly enjoyed Kyu Sushi. The decor was simple with a few artists’ prints on the wall; it felt more like a coffee house than a sushi restaurant. However, the wait staff was very friendly and the food was tasty. 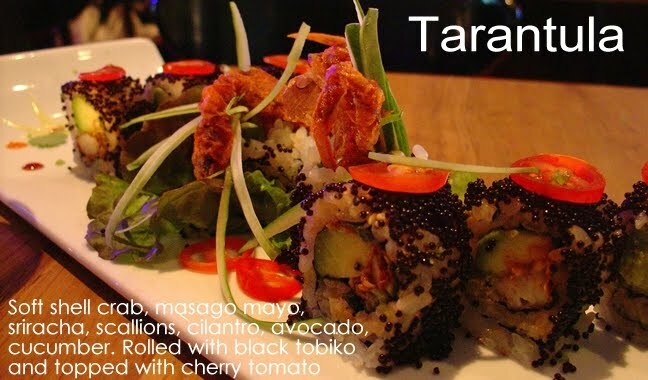 My husband ordered both the Tarantula roll ($11) and the Volcano roll ($13). He liked both of them a great deal, in part because he has never had sushi like this before. 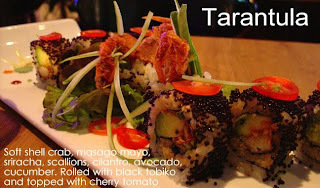 The tarantula had a spicy taste and had a bit of a Thai taste to it with the cilantro and siracha. 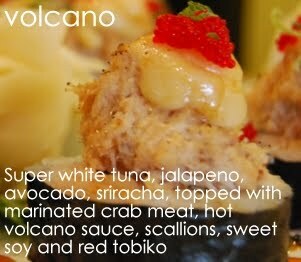 The Volcano roll also had a spicy zip to it that he enjoyed; the creamy taste of the sauce went well with the richer taste of the super white tuna. He liked the eye appealing presentation of both rolls. My kids split the Tempura Udon Noodles ($9). We also ordered Miso Soup ($1.50) with extra tofu for my daughter. I was suprised they did not charge extra for the tofu. My son and husband split the Tekka (tuna) roll ($4). Compared to other sushi restaurants we have been to, there was alot of tuna in this roll. It was quite a value for $4. I ordered two of the Ebi (shrimp) Tempura rolls ($6 each) without mayo. The sweet brown sauce over the Ebi Tempura rolls made it delicious. Our total was $50.50 plus $5.56 tax for a grand total of $56.06, minus the Groupon value of $50 = 6.06. We left a tip of $7.94. Total out of pocket at the restaurant was $14.00 plus the $25 we paid for the Groupon back in February = $39.00. We saved $25.00. We thoroughly enjoyed this restaurant and may go back sometime, even if it does mean a 40 minute drive downtown. I could SO go for some sushi right now! I'll tell my little sister about this place since she lives in Chicago. I was entering a giveaway and noticed you didn't have comment numbers yet. I didn't for a while and counting a winner was a pain. I used steps 1 and 2 of this tutorial to add them to my blog layout.